Whether I am up in my childhood home on my little island in Alaska, or down in my own families home in Oregon, I carry the love of the holiday season and my attachment to the love of making snowmen in my heart! And if there's no snow outside, well I can always make a quilted or fabric crafted snowman (or woman, or children) inside! 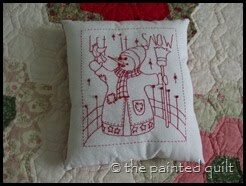 In honor of the returning of the light into the darkness and the joy that is ours to claim...free snowman quilt and quilt block patterns...and maybe just a few other fun links, besides! My apologies if any images disappear. Sometimes a website's bandwith can't support their own images anymore for me to use to link to them, and sometimes they just change web addresses or close down. I try to do my best to keep this site updated but I share sooo many free patterns, links, and tutorials, and love to blog about my real life, and to sew, craft, and quilt...a lot!...that I just do the best I can! Vermillion Stitchery 2008 BOM Snowman stitchery patterns: Free! 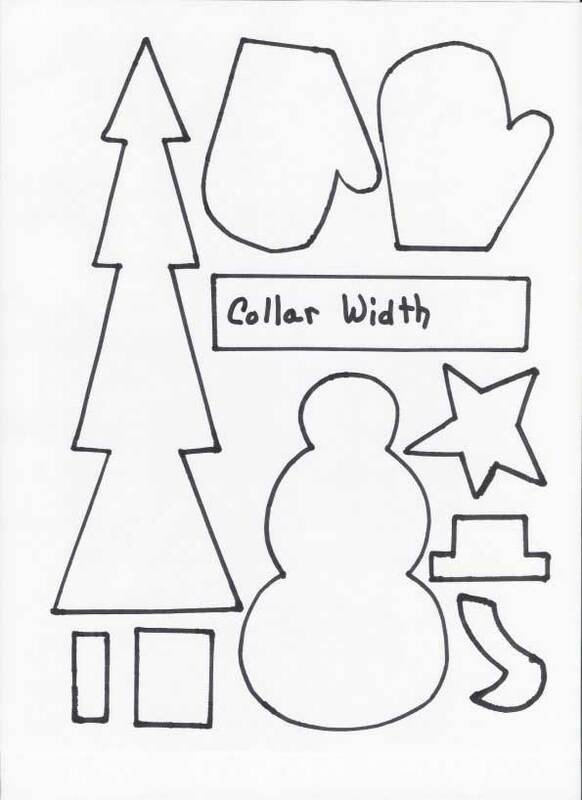 Need a snowman quilt block pattern for your next holiday or winter themed quilt? Check this one out! Ideas that are so easy...you don't even need a pattern! Haven't cleaned these out yet or checked for link continuity..but a lot of them are really, really fun! A free applique christmas patterns from Free Applique. A Bejewelled Christmas Skirt A Christmas Tree skirt from PB Textiles. Angel - 4" paper-pieced quilt block from AZPatch. Angel - Applique pattern designed by Beverly Howell. Appliqued Angel designed by Donna Fite McConnell. Candle - 4" paper pieced quilt block from AZ Patch. Christmas Mystery - Mystery quilt designed by Suzanne Sealey and Susan Gatewood from Compuquilt. Christmas Star Table runner - A 15-1/2" x 45-1/2" pieced table runner pattern from Bella Online. Holly Wreath Block - From Arbee Quilts. Various Christmas Blocks - From Free Quilting .com. Christmas Angel - Strip Quilting by Carolyn Englert from Crafty College. Christmas Bells Table Topper Part 2 - from Judie Bellingham Bellaonline/Quilting. Christmas Dove - Applique quilt block designed by Jaydee Price for The Applique Society. Snowflakes pattern to Needleturn applique - From the Applique Society. don't have the original link up for these just the downloads..will look for and give credit!!!! 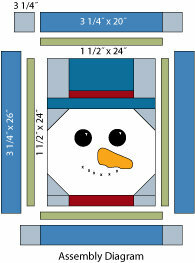 Snowflake block - A Snowman Quilt block from Quilting Passion. Christmas Geese Block - A delightful Geese Block from McCall's Quilting. A Christmas Card - From Patchpieces. Christmas Bells Table Topper Part 2 (see below for part 1). - from Judie Bellingham Bellaonline/Quilting. Santa Cats Table Runner - A fun table topper with Santa Cats – so cute! Christmas Romance Wallhanging - 57" x 57" pieced quilt pattern designed by Janet Page for Cranston Village. Christmas Trellis Table Topper - by Lucy Fazely. Patchwork Star Table Decoration - From christmas-projects.com. Jingle Bells Wallganging - A gorgeous wallhanging from This n That fabrics. Christmas Bells Table Topper Part 1 (see above for Part 2) - From Judie Bellingham/Bellaonline. Gathering Around the Christmas Tree - A lovely Christmas Tree pattern by Sandra Field. Christmas Tree with Presents - 12" pieced quilt block from Quiltaholics. Ho Ho Ho Christmas Tree Skirt - from McCalls Quilting. My Favorite Christmas Thing - A delightful Block of the month with a Christmas theme. Beaded christmas Ornaments - Gingerbread Man - from the fantastic patterns of Lucy Fazely. Angel O'Tulle - Gingerbread Man - A cute gingerbread man ornament from Get Creative Show. Ho Ho Ho Tree Skirt - 40" x 40" appliqued quilt project from McCall's Quilting. Christmas Wonderland Table Runner and Placemats - Designed by Maggie Sharon. 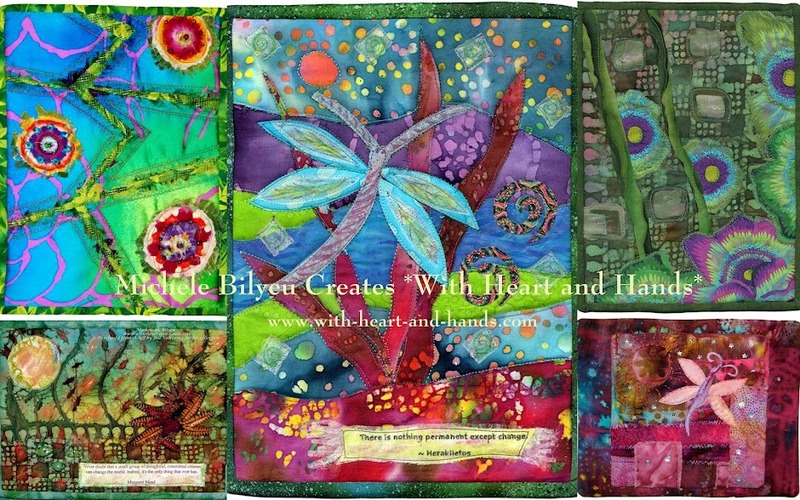 Free patchwork Christmas Cards to make - from Judie Bellingham at Bellonline/Quilting. Christmas Pincushion - A lovely secret santa gift from Crafttown. Chrismas Pot Holder -a very useful gift from Craft and Fabric Links. Santa Door Banner - From the fine patterns of Debbie Mumm. Santa Boot Christmas Stocking - A terrific boot stocking from EZquilt. Many varied pieced Christmas patterns - from the Christmas Applique collection at Block Crazy. Miscellaneous Christmas patterns from Free Patterns. 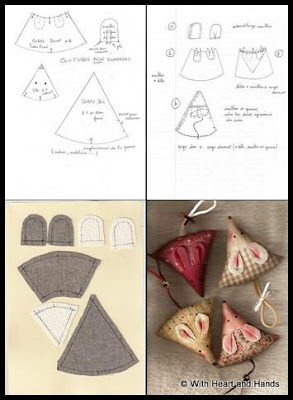 Antique Bell Ornaments - From Quilt Seeds. Christmas Star Table Runner - From Quilter's Cache. Stars Allround Tree Skirt - from Quilting About. Santa - 4" paper pieced quilt block from AZ Patch. Simply Santa Quilt Pattern - a free quilt pattern from Compuquilt. Santa Face - e from Quilter's Cache. Signature Ornament - 3" paper pieced quilt block from PC Piecers. Signature Ornament - Paper pieced quilt block by Linda Deperro. Stocking - 6" paper pieced quilt block from Ginger Glaser. The Twelve Days of Christmas - applique series from Quilter's Cache. Christmas Gift or Money Holders - from BOM Quilts.com. Whitehouse Christmas Tree Quilt - 26" x 30" pieced quilt pattern designed by Sharon Hultgren for EZ Quilting. Applique Christmas figures -s Applique Figures from Free Applique.com. Christmas Tree Placemat - Another pattern for your table from Husqvana Viking. Wreath - 3" paper pieced quilt block from the World Wide Quilting Page. Yule Logs - 56.5" x 56.5" pieced quilt by Mary Jobe Mason. Click on the tree skirt photo and ride Santa's jet sled straight to the tutorial! 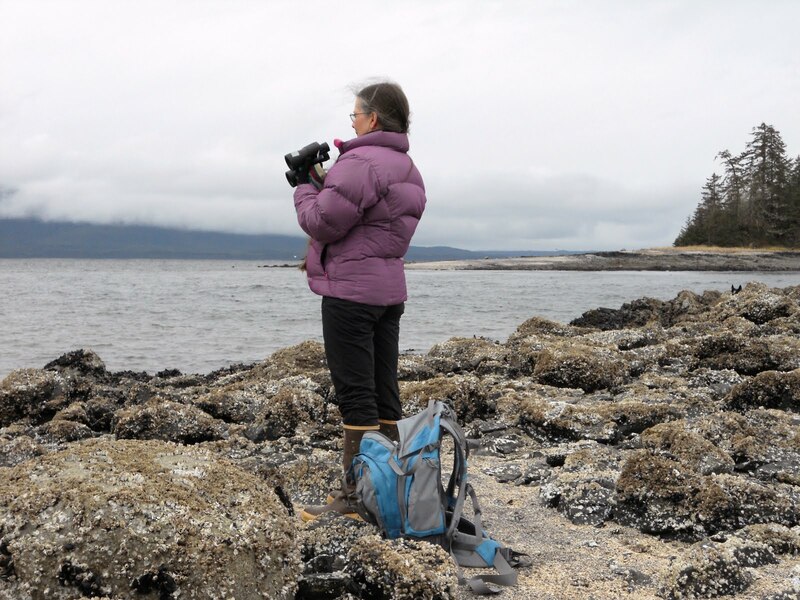 Michele Bilyeu blogs With Heart and Hands as she shares a quilting journey through her life in Salem, Oregon and Douglas, Alaska and all of her AAQI Quilting. 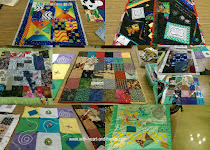 Sharing thousands of links to Free Quilt and Quilt Block Patterns and encouraging others to join in the Liberated Quilting Challenge and make or donate small art quilts to the Alzheimer's Art Quilt Initiative (AAQI) Help us change the world, one quilt at a time! I had to click to get a good look and wow was was my first thought. I love, love, love it. That just beautiful. Is that stichery pattern still available? - An evolution of the Easter Bunny thing. Yet, how it actually is...becoming. Something to think/ talk about. Eventually. Easter Greeting - Artist Credit: Lynnleigh, Age 6Life is Good!